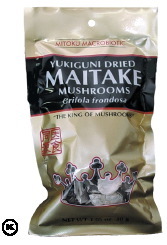 Natural Import Company - Traditional Japanese foods - Mitoku Yukiguni Maitake - 1.05 oz. We consider ourselves very fortunate to be able to offer to you a rare and exceptionally medicinal mushroom known as Maitake. For thousands of years, Japanese Herbal Medicine (JHM) practitioners have been recommending Maitake as a tonic to strengthen the body, improve overall health and lengthen the human life span. There is also scientific research indicating that Maitake powder significantly lowers cholesterol, has anti-obesity activity (melts fat!) in both animals and humans and prevents constipation with no side-effects. Ingredients: Japanese Yukiguni dried maitake mushroom (Grifola frondosa).